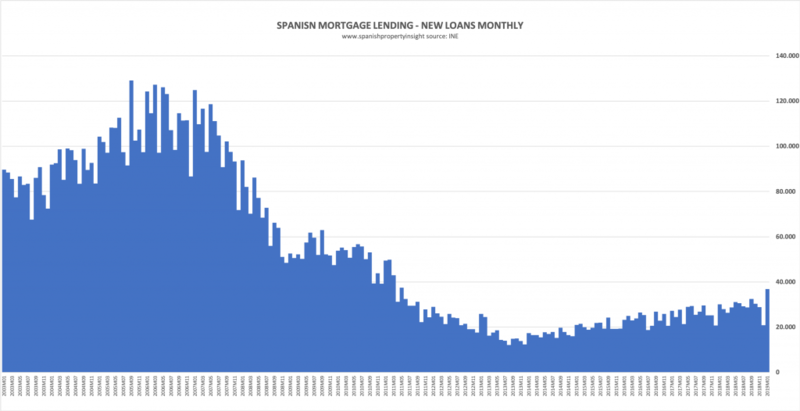 The latest Spanish mortgage news from the first quarter of 2019 – interest rates, mortgage costs, and mortgage market lending volumes from Spain. 12-month Euribor, the base rate used to calculate interest payments on most mortgages in Spain, came in at -0.109 for its average in March, a slight decline on the previous month, but 42,9% higher (less negative) than the same month a year before. As a result, borrowers in Spain with annually resetting Spanish mortgages will see their mortgage payments rise by around €4 per month for a typical €120,000 loan with a 20 year term. On a quarterly basis Euribor went from -0.129 at the end of December 2018 to -0.109 at the end of the first quarter 2019, following a trend towards positive territory started in March last year. However, as the chart above illustrates, Euribor bucked the trend and dipped slightly for the first time in a year during March. 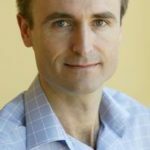 What might have caused Euribor to turn down for the first time in a year? Negative data from the Euro economy such as a manufacturing slump in Germany suggested that the ECB might have to delay any move towards tighter monetary policy, which means base rates will remain low for longer. That’s good news for borrowers, and bad news for savers. 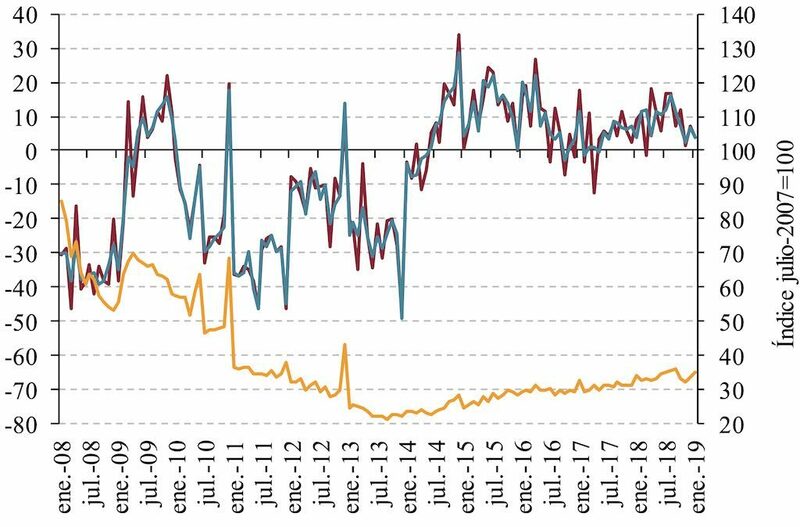 YOY Spanish mortgage lending (blue/red line left scale), index compared to July 2007 (yellow line right scale). Mortgage lending to home buyers in Spain was up 6.1% in January to 19,390 new loans, according to provisional figures from the Association of Spanish Notaries, the latest figures available. The average new loan made in January had a value of €135,616, an increase of 0.9% in a year. As long as mortgage lending for residential acquisitions continues to increase, as it has done for the last few years, the Spanish property market will continue to grow. The next and final chart, which uses mortgage lending data from the National Institute of Statistics (INE) that counts new mortgage loans inscribed in the Land Register a month or two after the notaries count them, paints a similar picture. You can see how the number of new mortgage loans collapsed between 2007 and 2013, and have been gradually increasing ever since, though the overall market remains a fraction of what it was in the boom years, still down something like 70%.